Crispy, flaky crust surrounds this gooey apple filling making this mini-apple pie the perfect treat! 1. Core and peel the apples. Chop them into small pieces and place in a medium bowl. Add lemon juice and stir. Set aside. 2. In a large saucepan, add the butter and melt over medium heat. 3. Add the sugar, brown sugar, cornstarch, cinnamon, nutmeg and salt. Mix until combined. 4. Add the water and bring contents to a slow boil. Let boil for 3 minutes, constantly stirring, until mixture starts to thicken. 5. Add the apples and simmer over low heat for 10 minutes. 6. Remove from heat. Stir in vanilla and set aside to cool. 7. Pre-heat oven to 400 degrees and grease a 12-count muffin tin. 8. While the apple mixture is cooling prepare the pie crusts. Roll 1 1/2 pie crusts on a floured surface around 1/8” thick. Cut 3 1/2” circles out using a cookie cutter or the bottom of a bowl or glass. Re-rolling the dough until all 12 circles are cut. 9. Press the circles in muffin tin cups. With your fingers, press dough down until the sides come up making a shell. Cut away excess with a sharp knife. 10. Fill each cup with apple filling about 3/4 of the way to the top. 11. Roll out remaining 1/2 of pie crust and cut into small strips to lattice on top of pies,or cut 2 1/2 inch circles to cover the pies. If using the circle cut outs, make sure to poke a vent hole in the top to allow the steam to escape. 12. Brush the tops of the pies with egg wash and sprinkle with sugar. 13. Bake for 16-18 minutes until the tops are nice and golden. 14. Remove from oven and let cool for 10 minutes before removing from muffin tin. Let finish cooling on a wire rack. Core and peel the apples. Chop them into small pieces and place in a medium bowl. Add lemon juice and stir. Set aside. In a large saucepan, add the butter and melt over medium heat. Add the sugar, brown sugar, cornstarch, cinnamon, nutmeg and salt. Mix until combined. Add the water and bring contents to a slow boil. 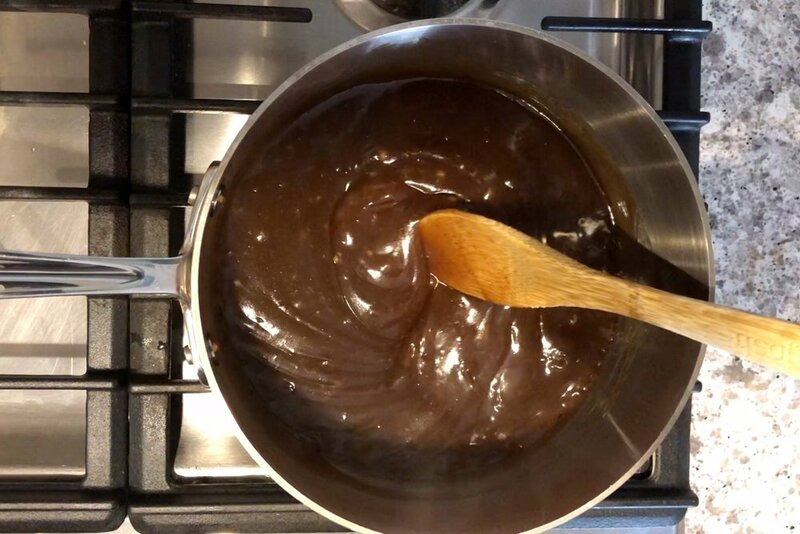 Let boil for 3 minutes, constantly stirring, until mixture starts to thicken. Add the apples and simmer over low heat for 10 minutes. Remove from heat. Stir in vanilla and set aside to cool. Pre-heat oven to 400 degrees and grease a 12-count muffin tin. While the apple mixture is cooling prepare the pie crusts. Roll 1 1/2 pie crusts on a floured surface around 1/8” thick. Cut 3 1/2” circles out using a cookie cutter or the bottom of a bowl or glass. Re-rolling the dough until all 12 circles are cut. Press the circles in muffin tin cups. With your fingers, press dough down until the sides come up making a shell. Cut away excess with a sharp knife. Fill each cup with apple filling about 3/4 of the way to the top. Roll out remaining 1/2 of pie crust and cut into small strips to lattice on top of pies,or cut 2 1/2 inch circles to cover the pies. If using the circle cut outs, make sure to poke a vent hole in the top to allow the steam to escape. 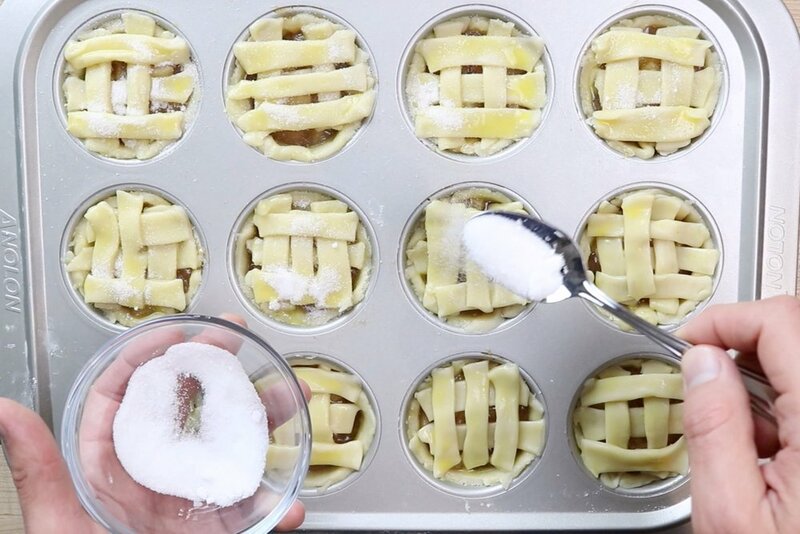 Brush the tops of the pies with egg wash and sprinkle with sugar. Bake for 16-18 minutes until the tops are nice and golden. Remove from oven and let cool for 10 minutes before removing from muffin tin. Let finish cooling on a wire rack.